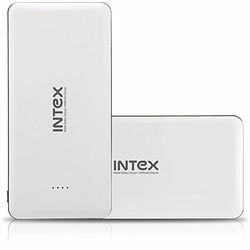 Grab your hands on the all new Intex IT-PB 10K Poly power bank with a 10000 mAh power backup so your smartphone never runs out of battery. Even can share the power bank with your friends as it has 2 USB charging ports capable of charging 2 devices at a time. Along with LED Indicator for charging indication, IT-PB 10K Poly comes with a free Micro USB cable. Grab your hands on the all new Intex IT-PB 10K Poly power bank with a 10000 mAh power backup so your smartphone never runs out of battery. Even can share the power bank with your friends as it has 2 USB charging ports capable of charging 2 devices at a time. Along with LED Indicator for charging indication, IT-PB 10K Poly comes with a free Micro USB cable.